We believe that the mission of Habitat for Humanity to provide housing for the public is one of the most important missions an architect and citizen of the world can embrace. Southern Louisiana provides a rich cultural and climatic canvas in which to complete this mission because of the deep sense of community reliant on cultural identity. Thusly, this strong rooted community identified universally as unique requires a specific and regionally relevant response to the Habitat for Humanity mission. It is easy to pick up and move when the culture you know is all McDonalds. But if you grow up the way I did, in Louisiana, you don’t in your travels, find anything like it. Because of this important relationship in Southern Louisiana between culture, community, and climate, we believe it is of utmost importance to maintain this relationship in the built environment. It is imperative that the architect contributes to the continuum of the culture as well as the environment. We must be vigilant in our pursuit to understand the principles that led to such an identifiable and vibrant relationship between culture, community, and climate. We must be vigilant to understand that no culture is stagnant. The traditional Malay house is characterized by a post and beam frame. The roof is supported from the frame and is steeply pitched to create an attic space under the roof. Large gables are placed at each end of the space. Ventilation to the attic space is provided through the gable walls. These walls are split into segments which are inclining and displaced. This has two functions, first preventing low angle sun from penetrating the attic and second providing ventilation. The Veranda House transforms the architecture of a veranda into an overall design language. 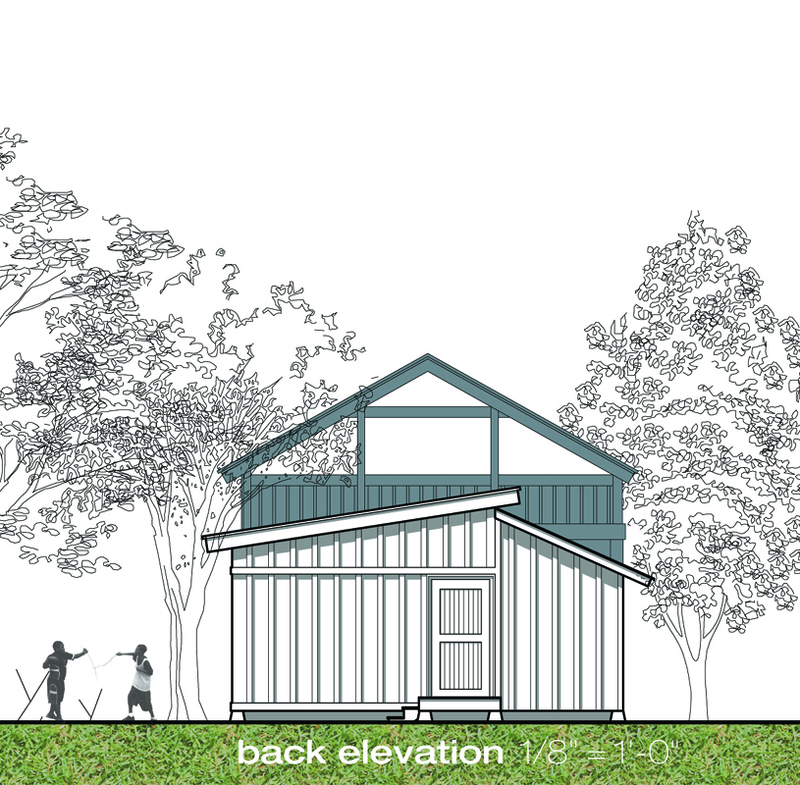 Two verandas frame the proposal: one at roof level and one adjacent to the south side. They serve as the cultural response to the requisite porch, yet their arrangement and orientation deviate from the traditional. The roof veranda serves as the public exterior room where communication occurs. It addresses the street, establishes the owner’s identity, and presents the home to the neighborhood. Its placement above the home provides better vantage of the street and gives precedence to this necessary cultural transitional space between public and private. It also allows the external elements surrounding the house to bleed through, creating a unique façade wherever it is placed. The side veranda creates a semi-private exterior room. Its adjacency to the private portion of the interior results in a change of program from the more social roof veranda. On the side veranda, laundry can be hung, outside toys can be stored, and children can play under the watchful eye from the kitchen. It also provides sheltered entry from the drive into the private portion. In response to the culture of Habitat to provide ‘’simple, decent, and affordable’ housing, the Veranda House provides an expandable design. The base design consists of the required program of three bedrooms, one bathroom, living, dining, and kitchen. The house can be added to or subtracted from as needed by the prospective owner without disturbing the overall aesthetic or construction. Since Habitat for Humanity builds homes for a variety of owners, the Veranda House provides a simple yet flexible design. The climatic responses of a Malay house inspire the Veranda House with a roof dominant architecture. In hot and humid climates, the appropriate methods for energy efficiency are as follows: to minimize heat gain, to maximize ventilation, and to maximize shading. The roof addresses these methods. The Veranda House uses the roof veranda as a defensive element providing rain and sun protection to the walls (shape and structure), shading the external spaces from extreme heat (reflective material), and diffusing the natural light (overhangs and fiberglass sheets). The side veranda also responds to the climate by providing much needed shade on the south face, reducing ultraviolet radiation and heat gain. It can also serve as an armature for plants to promote evaporative cooling. These verandas, in a sense, are intermediate zones between building and climate, sheltering and shading spaces. fenestration is climatically responsive, more on the north, less on the south; windows anddoors are aligned to allow for cross-ventilation. inclined south wall combined with veranda blocks extreme heat gain. Our material response to the Habitat for Humanity mission makes use of SIPs, structurally insulated panels. SIPs are high-performance building panels for floors, walls, and roofs in residential construction and have been used by Habitat for Humanity - Plains, GA. Two homes were built using SIPs and then were tested for air-tightness. They proved to be superior to the typical 2x4 balloon frame construction. Each panel is made using expanded polystyrene (EPS), or polyisocyanurate rigid foam insulation sandwiched between two structural skins of oriented strand board (OSB). Other finish surfaces are available allowing an owner to designate an aesthetic. This aspect can help establish ownership, ’provide them with a sense of pride something worthy of the title HOME’. SIPs are easy to install since the cutting and fabricating are done in the manufacturing plant. That reduces site labor and the time building materials are exposed to the weather on the job site. SIPs are also made in large sizes up to 8 ft by 24 ft so assembly on-site is faster, work crews are more productive, and the project is “dried-in” sooner. The result is a building system that is very strong, predictable, energy efficient, and cost effective.